Ever wanted an iPhone that’s also a satellite phone? We hadn’t either, but bear with us and you may change your mind for a while. It’s happened to us all. You’ve been out in the wilderness, looking for the Chrystal Skull or the Holy Grail and bam. You forgot to ask your wife to record the football game. No worries, just give her a call and set her on her path. The problem though? Well, you’re in the middle of nowhere. You’ve not got clean water, let alone cell reception, a terrible situation if you’re asking us. What you need is a satellite phone, but if there’s one thing cooler than a phone that uses satellites, it’s an iPhone that uses satellites. That’s where the SatSleeve comes in to save the day. Made by the almost unpronounceable Thuraya, the SatSleeve is pretty much what it sounds like – it’s a sleeve-type case for your iPhone 4, 4S or iPhone 5 that connects to the company’s satellite network, letting you make calls and, soon, access data too, which is a big golden point if you’re in the middle of nowhere. No more will you be without cell reception when you need it most. The kit isn’t cheap, though. You’re looking at upwards of $500, and that’s before you start paying for the calls themselves which range from around a dollar a minute to eight times that amount, depending on where you are. Maybe it’s worth missing that game, then! The case itself also acts as a battery, charging the inserted iPhone at the flick of a switch. 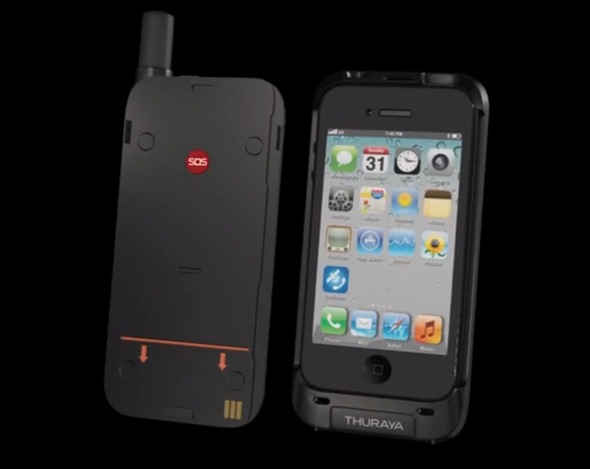 Thuraya claims 48 hours worth of juice, which is not to be sniffed at. The device can also worth without any iPhone being inserted in emergencies too, thanks to its built-in speaker and microphone. Obviously, the SatSleeve is not going to be for everyone, and we don’t think it’s a viable option for when your AT&T connection isn’t doing the business. If you’re the kind of person that finds themselves in the middle of the desert all too often, or out in the open ocean, then the SatSleeve may well be worth the entry price. The voice only version of the SatSleeve will begin shipping in April, with the data version coming afterwards.